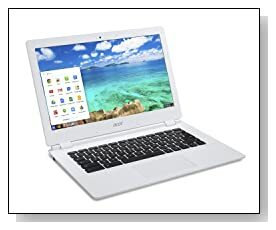 Moonstone white Acer 13 CB5-311-T9B0 is the first Chromebook with the new quad core NVIDIA Tegra K1 processor as well as a larger 13.3 inch Full HD screen for sharper display, up to 11 hours of battery life- one of the longest on offer, 3x faster wireless connection 802.11 A/C, 100GB free Google Drive storage for two years, a nice slim design and features that are unique to Chrome systems such as built-in security and constant auto software and system updates in the background. Acer 13 CB5-311 comes with the 4-Plus-1 quad core NVIDIA Tegra K1 processor (ARM Cortex-A15 Mobile) at 2.1 GHz speed, 2 GB DDR3L SDRAM, 16 GB Flash storage and 2 years free of charge 100GB Cloud based Google Drive storage that lets you have access to your files from anywhere and with the auto back-up for security and Google Chrome operating system. The new CPU shows itself more in 3D gaming performance and smooth running of several tasks- efficient multitasking but we didn’t notice that much difference in speed for usual daily tasks, but the system boots up in about 7-8 seconds seconds and wakes up from hibernation almost instantly. 4+1 means the processor has an additional low power core to deal with simple tasks. 13.3 inch Active Matrix TFT Color LCD ComfyView anti-glare widescreen LED-backlit display with Full HD 1920 x 1080 pixel max screen resolution, 16:9 aspect ratio and NVIDIA Kepler GPU with 192 NVIDIA CUDA cores and shared memory with CPU to offer smooth visuals in photos and videos and much better gaming performance with the new graphics card that is unique to Acer 13 and the new NVIDIA Tegra. Anti-glare means anti-reflective and you can use the Chromebook outdoors comfortably but there is no IPS function so don’t expect large viewing angles- fair enough as this is an expensive feature. It has a high definition webcam with a built-in microphone that is optimised for Google Hangouts to chat with people in high resolution. Being the first Chromebook that can support 3D gaming, you can play games like HexGL and SkiD Racer but there aren’t a lot of 3D games for Chrome yet. You will enjoy the improved gaming performance, smooth streaming of media and clear images in Full HD but one little thing is the texts appear a bit small so you may want to keep the screen at 120%. 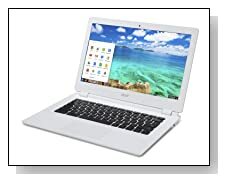 Moonstone white with polycarbonate chassis Acer CB5-311 weighs 3.31 pounds and has the dimensions of 12.87 x 8.96 x 0.71 inches- very slim and lightweight so it is super portable and will fit into any bag easily and looks sharp but it appears to be prone to stains and smudges. 4-cell lithium ion battery (48Wr) gives you up to 11 hours of battery life but our guess would be more like 8-9 hours on average but this is still great. It has a fan-less design which helps it work very quietly and a reliable and comfortable enough keyboard with a tactile feeling and slightly raised keys and a decent size white touchpad below the keyboard in the middle that supports Chrome gestures but no separate numeric pad due to the size of machine. There is no optical drive but a fast 802.11 A/C wireless with MIMO technology (Dual-Band 2.4GHz and 5GHz) with wider coverage, Bluetooth 4.0, 2 x USB 3.0 ports, Secure Digital (SD) card reader that supports up to 64GB SDXC, an HDMI port and a Headset jack so not a super great deal of connectivity ports but certainly adequate for a Chromebook. Conclusion: Acer 13 CB5-311-T9B0 has a 32% larger display than regular 11.6 inch Chromebooks and it is anti-glare and Full HD so you can enjoy sharp and bright images and decent advanced gaming performance of the new NVIDIA CPU and GPU. Battery life is one of the longest we have come across in Chromebooks so you can be out and about all day long without having to recharge the battery. 802.11ac wireless connection offers up to 3 times faster connection and improved coverage than the standard 802.11bgn wireless. The case feels solid and has an overall nice look in moonstone white colour and the keyboard feels comfortable to type on. The LED status light is bright blue and can be a little annoying in darker environments. It is not a super fast Chromebook in daily use but runs smoothly and allows plenty of multitasking and it shows itself more in 3D gaming performance. Storage is only 16GB but being an SSD rather than HDD, it helps with much faster boot-ups and resuming from sleep. NVIDIA Tegra K1 is promoted as the world’s most advanced processor on manufacturer’s website but it is not really very fast but shows itself in gaming and considering there is not a lot of 3D games out there for Chrome systems, and the display is not perfect even though it is Full HD but at this price level you are definitely getting your money’s worth. This is a decent computer for the price that is very well built and comes with many practical features. It will come down to your choice, whether you want a different Chromebook with a larger screen or a budget Windows PC with a sluggish entry-level processor.